40 years after the US invasion of Vietnam, its grave legacy is still lasting. Millions of square meters of land in Vietnam are still contaminated with unexploded ordnance and toxic agents which have done serious harm to 4.8 million people. Therefore, dealing with those remnants of war is a critical mission in Vietnam. The Chemical Corps, as the key force in disposing of toxic legacy of war, has been strengthening the conduct of this mission with practical measures. During the war in Vietnam, the U.S. Army used not only lethal but also chemical weapons to exterminate all means of existence and stop our forces. According to the latest data published in the international conference “Assessment of consequences of Orange Agent/Dioxin used by the U.S. in Vietnam War” held on 8th – 9th August 2016 in Hanoi, in 10 years (1961-1971), the U.S. scattered 80 million litres of chemical agents - 61% of which was the OA containing 336 kilograms dioxin (one of the most toxic agents human being has ever known) and over 9.000 tons of CS - over ¼ of territory of South Vietnam, exposing around 4.8 millions of Vietnamese people to the OA/dioxin. Acknowledging the serious consequences of U.S. chemical agents used in Vietnam, after the war, Vietnam Communist Party and Government attached great importance to the work of cleaning up the chemical agents which has seen certain results. However, national and international researches showed high dioxin concentration in several places, especially military airports, such as Bien Hoa, Danang, Phu Cat. To deal with the contamination, on 24th May 2017, the Prime Minister released the Decision 701/QĐ-TTg on the establishment of National Steering Committee for unexploded ordnance and toxic legacy of war. The Central Military Commission also approved the Project for the establishment of the Standing Board of the Committee and its Office (Project 701). According to those documents, the Environmental Technology Center, also known as National Action Center for Disposing of Chemical and Environmental Consequences, will have more functions. The Chemical Corps is tasked by the Government, Central Military Commission and Ministry of Defence to play the key role in detecting, collecting and disposing of toxic agents remaining after war, which is seen as the peacetime “combating mission” of the Corps. Grasping the mission, in recent years, the Chemical Corps has been proactively giving consultancy to our Party, Government and Ministry of Defence on the contamination situation and their studying and detoxifying programs. They have also cooperated with other military and civilian units and centers in searching for the way to deal with dioxin and CS agents. Between 1996 and 2016, the Corps conducted nearly 20 projects and missions of detecting, collecting and disposing of chemical agents remaining after war in 34 provinces and cities as well as warehouses of General Department of Technology and No.5, 7, 9 Military Regions. They also successfully dealt with hundreds of tons of CS agent, a number of weapons containing this poison and nearly 170,000 cubic metres of OA/dioxin contaminated soil from Bien Hoa Airport during their projects XD-1 and XD-2. Besides, they gave their technical advice to the general plan for disposing of 7,500 cubic metres of OA/dioxin contaminated soil in Phu Cat Airport as well as played the role as supervisors in the decontaminating project at Danang Airport. Those projects provided highly reliable data, which is important in the evaluation of general chemical contamination situation and protection of environment in various areas, especially strategic ones. The data is also used by our Party and Government to develop guidelines and measures for future economic – social development. Although the disposition of chemical legacy, especially OA/dioxin contamination, has produced many important results, the remaining work is huge. Therefore, it is urgent to absolutely dispose of contaminated areas and take full control of OA/dioxin sources, which requires contributions from many establishments and organizations at all levels as well as our people, among which the Chemical Corps is the key player. In the coming years, the Chemical Corps will continue to consistently and comprehensively implement both short-term and long-term measures, focusing on these following ones. First, to propagate the guidelines and policies of our Party, Government and Ministry of Defence on disposing of toxic legacy of war to our military personnel, focusing on Instruction 43/CT-TW released on 14th May 2015 by the Secretariat on strengthening our Party’s leadership over disposing of toxic legacy of the U.S. in its war in Vietnam; Decision 651/QD-TTg released on the 1st June 2012 by the Prime Minister on his approval to the “National Action Plan on Basic Elimination of Toxic Legacy of the U.S. in the War in Vietnam by 2015, towards 2020”; the Decision 701/QD-TTg released on 24th May 2017 by the Prime Minister on “The Establishment of National Steering Committee for Disposing of Unexploded Ordnance and Toxic Legacy of War in Vietnam”; the Instruction 05/CT-BQP released on 3rd February 2017 by the Minister of Defence on “The Implementation of Military’s Projects and Programs for Chemical/Dioxin Agents”, etc. This activity will help the officers and soldiers of the Corps, especially Party committees, commissars and commanders at all levels, understand the importance of the disposal of toxic legacy of war in people’s life as well as in our course of national defence and development, thereby improving their leadership and all officers and soldiers’ will and determination in dealing with difficulties and dangers for the accomplishment of their missions. At the same time, people need to be provided information about how to avoid toxic chemicals remaining in their surroundings and minimize their effects in order to safeguard local production activities and normal life. Second, to focus on force building, equipment acquisition and other resource development to improve our capacity in dealing with toxic legacy of war and protect the environment. First of all, the leadership of the Corps should focus on the development of their intellectual military personnel in both qualitative and quantitative terms, especially leading and qualified experts in technologies for disposing of toxic legacy of war. The Corps needs to make breakthroughs in systematically implementing measures, such as: to cooperate with military and civilian academies and universities in training chemical engineers, post-graduate officers of toxic disposal; to receive and master new technologies for tackling pollution; to participate in chemical analysing courses funded by international organizations, etc. At the same time, the Corps should formulate suitable policies to attract more qualified graduates in needed majors. Currently, nearly 100 officers of the Corps are studying chemical, biology and environment. They should further enrich their knowledge and experience through on-the-job training courses as well as scientific researches and projects and technology transfers. To create a special force for disposing of toxic legacy of war, chemical, radioactive and environment accidents, subordinate units select officers and soldiers who are qualified in terms of political and discipline awareness, health, morals, qualifications and provide them with modern equipment. The Chemical Corps is giving its efforts to enhance the ability of Center for chemical, radioactive and environmental response and Environmental Damage Repair Team, which are subordinate units of the Corps, to ensure they are able to successfully execute their missions across our country and ASEAN. At the same time, Project 701 should be effectively implemented, and the National Action Center for Chemical and Environmental Damage Repair should do its best in carrying out its missions. Third, to keep researching into and improving the technologies for disposing of dioxin-containing agents. It is very difficult to deal with dioxin contamination in Vietnam because of the large amount of this agent, the considerable width and depth of contaminated soil and the fact that contaminated places are located in a very large territory. Therefore, it is not easy to choose the best technology for resolving this challenge. Recently, the Corps has been trying to apply new results of their OA/dioxin disposing researches to reality. However, they need to continue their efforts in researching and choosing reliable and suitable technologies for completely disposing of OA/dioxin, especially in severely contaminated places, thus preventing air, land and water secondary contamination at minimal cost. With new research results, the Corps is making their efforts to improve their technologies so that they can be applied to most cases to detoxify OA/dioxin contaminated areas. Fourth, to closely cooperate with other military units and relevant local bodies and authorities in detecting, evaluating and dealing with contaminated areas. The disposal of toxic legacy of war is a complicated and difficult mission that can made impacts on every aspect of social life. Hence, as a key force, the Chemical Corps will continue to closely cooperate with other services, forces and local authorities to created a collective strength in conducting this mission. Apart from disposal of toxic legacy of war, the Corps also gives its consultancy to local Party Committees and authorities about adopting necessary measures to prevent potential chemical accidents from happening in chemical factories and industrial zones as well as about how to use the surrounding zones of contaminated places. At the same time, the Corps is proactively propagating the possibilities of being exposed to OA/dioxin and how to avoid it. Fifth, to strengthen international cooperation in disposing of OA/dioxin. Vietnam is increasingly integrating into international community, which means it is possible for us to call for international cooperation in dealing with our toxic legacy of war and protecting the environment. First of all, the Corps needs to thoroughly understand our Party’s opinion of foreign affairs, then closely follow the leadership of the Central Military Commission and Ministry of Defence in strengthening international cooperation in this field, focusing on mobilising external resources, receiving new technologies and experience from highly scientifically and technologically developed states. 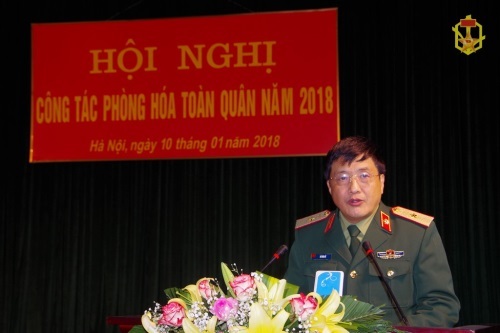 In the coming years, following a plan adopted by the Ministry of Defence, the Corps will cooperate with several companies from the U.S., Japan, Israel in designing pilot projects for disposing of the entire amount of soil contaminated with OA/dioxin at Bien Hoa Airport and other dioxin contaminated areas in order to test and find out feasible technologies which are most suitable to Vietnam’s conditions.